One consequence of my increasingly paper-less office—a corresponding increase in the number of PDF files that come in via e-mail, that I download from the Web, and that I create myself. I’ve got PDFs scattered all over my hard drive, and it’s getting harder to keep them all in order. That’s the problem that Ironic Software’s $34 Yep 1.6.2 ( ) is here to solve. Simply put, it’s a file manager specifically designed for PDFs, handling those files in much the same way iPhoto manages your photos. When you first launch Yep, it searches for every PDF on your Mac. That in itself is not particularly clever. (Tiger users could easily create a Smart Folder in the Finder that’d do the same thing.) But the program then lets you do some clever things with the PDFs it finds. Cleverest of all: Yep lets you tag your PDFs, attaching keywords to each file which you can then use to search, sort, and manage those files. So, for example, if you’ve got a bunch of PDFs associated with a given project or client, you could use the project- or client-name as a tag and then get quick access to all the associated PDFs. Yep will also auto-tag your PDFs for you, using tags you’ve used in other documents, the file’s home folder, contacts from your Address Book, and common “tag-like” words it finds in the file (“work” or “personal” or “invoice,” for example). Auto-tagging may overdo it a bit, adding more tags to a file than you might want, but it is a quick way to take a first pass at tagging your collection. Once you’ve done that tagging, you can view your files in the nifty Tag view: You’ll see a list of tags in the left-hand sidebar, each one sized according to the number of PDFs that use it (as shown on the right). You can also export Yep’s tags as Spotlight metadata (though I wonder why Yep’s creators didn’t just use Spotlight metadata as the default). Tagging makes finding and managing PDFs a lot easier. Once you’ve searched for all the PDFs associated with a project, for example, it’s a snap to select them all and move them to whatever folder you like. (At the same time, you could also use Yep to forego filing altogether, opting instead to find files using tags and search alone.) You can view PDFs in Yep’s own viewer or in whichever other app you specify. If you scan a lot of documents, Yep can also serve as scan manager (assuming, of course, you save those scans as PDFs). It supports TWAIN and ImageCapture, as well as proprietary scanner utilities. The program makes it simple to combine individual images into multi-page PDFs. Yep does have its limitations. 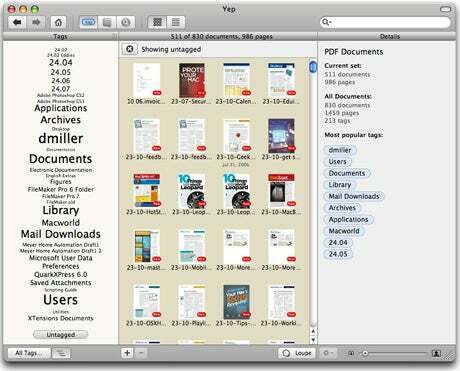 Unlike Preview or Acrobat Reader, it won’t let you annotate PDFs. Unlike DevonThink ( ) or Yojimbo ( ), which also help you organize the info-bits scattered all over your hard drive, Yep can’t handle any file formats other than PDFs. And if all you need to do is keep track of all the PDFs on your system, you can always just use a smart folder in the Finder. That said, if you need to process a lot of PDFs, Yep could be useful. But, with its $34 price-tag, you’d better have a lot of PDFs and/or a truly compelling business need. Otherwise, it’s probably overkill for most Mac users. Yep 1.6.2 requires Mac OS X 10.4 or later; it’s a Universal Binary.